When the offer to review this book came through, I was very excited. A mystery … a favorite new genre for me. Set in the 1920’s … one of my favorite eras for researching and writing about. And jazz music … easily my favorite musical style. And I looked over the information about the book, and about the author, Martha Conway … Edgar-nominated. Published in a number of fine literary journals. This really seemed right up my alley. So I dug into this with high expectations and a good deal of eagerness. And I was disappointed. They waited for a coal wagon to cross the street, pulled by a couple of skinny horses covered with matching green blankets. When a motorcar sputtered by, both horses skittishly lifted their heads, and Eve and Lena had to wait to get into the alley behind them as the coal man struggled to get the horses moving. Lena pulled out her pocket watch. She felt warmer and stronger in long pants. Also a sensation she hadn’t had since she was a girl—that she could break out in a run and leave everything behind. No one looked at her twice. The halting style is much the same here. This probably works really well in a short story, but 300 pages of this writing style grows tedious. I was also surprised at how simple the story was. For a 300 page mystery I was expecting a little more involvement of sub-plots but this is pretty straight-forward one story about a missing girl, Chickie, and the world of speakeasies and nighttime jazz clubs. So what did I like? Why two and a half stars? I liked the research that went in to the period. As I stated in the beginning, I really like this era. I liked the way the jazz world was portrayed and I liked the inclusion of the separate worlds for blacks and whites (which is always uncomfortable to read about but an important aspect of American life at this time). But the relatively flat portrayal of characters and the writing style that tells, not shows, and clips along without giving much depth or color, prevented me from really being brought in to the story. Looking for a good book? 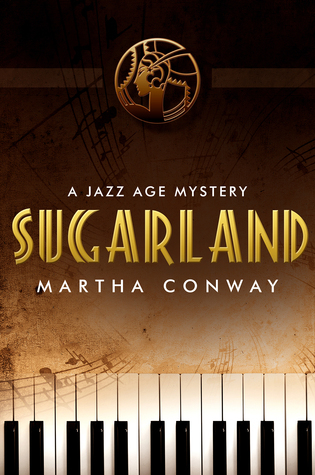 Though I liked the attempt and the choice of setting for this story, I can’t recommend Sugarland by Martha Conway. Although this book is just recently released by Angry Robot, it has been out for a little while (self-published, I believe) and it has been on my radar to read. Being a fan of many of the Angry Robot line of books, this looked like a good time to give it a go. There is a hidden treasure and the only man who knows where it is has been badly tortured, but manages to survive the overthrow of his kingdom. But now he needs that treasure and he hires a group of mercenaries to help him – but he doesn’t let them know too much, or what they might be about to face. This is an interesting, and often fun, band of characters and there are some moments that made me chuckle out loud (“You look like a sack of dog’s testicles…And I don’t mean that in a nice way.”). But while there is a fair amount of humor (often dark humor), it can be a pretty graphic story as well. All in all…pretty much what you would expect from a ‘buddy-quest’ fantasy novel. I was excited to go into this adventure – as I say, it’s been on my radar for a time – and was really looking forward to being taken away. But I wasn’t. There’s nothing wrong with this book – it hits all the markers it should hit and has all the prescribed characters with a good level of gruffness and humor. But it never drew me in. I never attached myself to any of the characters. An epic story means nothing if you aren’t rooting for someone or for a specific outcome, and that was the case here. 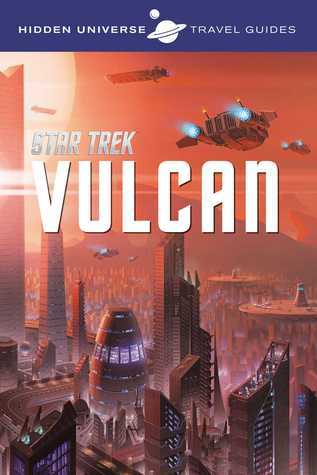 Perhaps it’s because I just recently read a really awesome epic fantasy (also released by Angry Robot) and my expectations were too high, but any fiction book needs to draw in the reader somehow, and this just didn’t do it for me. There’s enough here to that is good that I would try again with a follow-up novel (I may even given the audio book of this title a listen), but this one sits in the middle of the road for me. Looking for a good book? 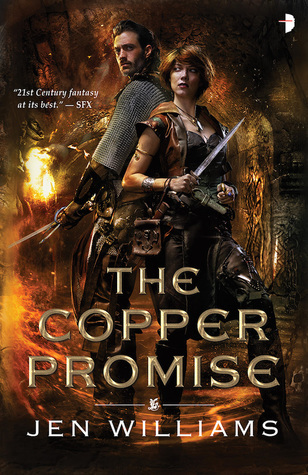 Jen Williams’ A Copper Promise is an epic fantasy story with some admirable traits and tropes, but fails to really bring the reader into the story. I get a lot of free books for review – probably more than I can actually read, but it is my goal to get through ALL of them, even if it takes awhile. Given that end, this is one of the older books in my queue that I’ve finally gotten around to reading. And as is so often the case with books that have been on my (digital) shelf for more than a couple of years, I find I quite enjoyed it and wished I’d read it sooner after I’d received it. I’m a sucker for books with Norse themes and history and this book is definitely targeted toward someone like me. This book is set in the 9th Century when Hakon the Black, a fearsome Norse Lord, ravaged Europe and Great Britain. It follows a time when the way of cruelty and barbarism and darkness intersects with the way of hope and lightness of Christianity. The story partially follows Vidar, alone in the frozen Northland, searching for the “Vestibule of Light” and thinking about his son, Niclaus, whom he left behind, and the future for Niclaus, foretold by Cado, a dwarf who appears to have supernatural powers. The writing is quite engaging and author Kenneth Gregory draws the reader in with his swift prose, engaging characters, and complex but intriguing story. He manages to get the brutality of Hakon across without resorting to simple blood and gore descriptions, and while the battles aren’t ‘world wars’ or even major warfare battles, they are still life and death situations for those involved and they come across as important campaigns. There are surprises that completely blind-sided me until quite late in the book, and I usually am not caught off-guard the way I was here, and I liked that! This was a really delightful read and I’d love to read more of Gregory’s work. Rumor is that this is the first of a series, and I hope that is true. Looking for a good book? 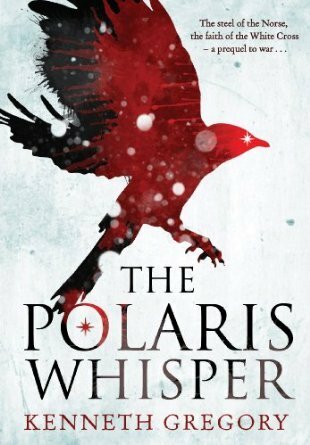 The Polaris Whisper by Kenneth Gregory is top-notch historical fiction with a Norse setting, characters that feel quite real, and just enough magic to bewilder and astound the reader. It is highly recommended. DARK SCREAMS: VOLUME FOUR – Brian James Freeman and Richard Chizmar, eds. The Dark Screams series of books is more like a magazine/novella crossbreed. It is a short anthology of fiction (in this series it has been five short stories in each volume) each with a dark fantasy or horror theme. Volume Four is a nice step up from the previous volume and more along the lines of the first two, in regards to quality. The collection kicks off with “The Departed” by Clive Barker. Barker is a powerful wordsmith and he makes the story incredibly readable, though the story itself fails to deliver a powerful punch. In the story a woman who has recently died longs to reach out to her child, still alive. “The New War” by Lisa Morton takes a horrific look at soldiers and PTSD as an old WWII soldier in a hospital is visited by something dark and frightening. Morton really draws the reader in with her prose. this is a powerful story. Ray Garton’s “Sammy Comes Home” is a classic monster story for the modern reader. A lost pet returns home … a little different. This was a lot of fun, even though it was pretty obvious from the start how it would end. “The Brasher Girl” by Ed Gorman is probably the longest story in the collection. It’s a lot of setup, which moves a little slowly at times, for a powerful ending. Heather Graham is the author of the final piece, “Creature Feature.” I was a little surprised to see her name here. I didn’t think she was a horror writer. This had a classic horror story set-up and resolution. A horror convention has a curse over it and the mannequins on display seem just a little too real for one person. Looking for a good book? 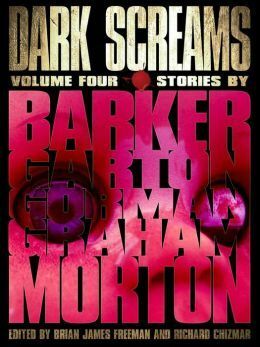 If you like the horror genre, Dark Screams Volume Four is a fun, light collection of stories that should entertain. Reggie Riot is no one’s idea of a cultural savior. The latchkey child of a busy single mother, he’s grown up to be a resentful slacker whose idea of high culture is getting stoned and admiring the graffiti in the alley where he scores his weed. His mother, however, is not your average working parent. She’s the head of a secret organization called Art Ops, whose mission is protecting the artistic treasures of the world—which have a lot more life in them than a casual observer might realize. This all seems relatively straightforward, but now toss the idea in a blender, along with the 1960’s black velvet paintings, psychedelic drugs, and some 1950’s angst, push the puree button and you start to get something that resembles this book. To protect the works of art, the art becomes (or already is – I’m not quite sure) real. Real people. Real places. The Art Ops takes those people out of the paintings, disguises them, and has them living secret lives. It’s sort of like the witness protection program, but for the living embodiment of art. Confused yet? No? Well, hang on. Now, there’s this ugly piece of art that’s jealous and trying to destroy the pretty art. And this is where the wacky, but full of potential idea falls. “Ugly” wants to destroy “pretty?” Really? That’s it? The story rambles but because, at its core, it was about art (something that will almost always catch my interest), I stayed for the ride, hoping that the jumble would pull together or at least make some sort of sense. Yes, it sort of does, but it never quite rises above the pedantic level to really take on the questions of what is art and how do we save it. The art itself is fair at best, which is really too bad, since it’s about art. It’s pretty typical comic book art ala the 1970’s. I was intrigued by the concept but this didn’t carry through with a coherent story. Looking for a good book? 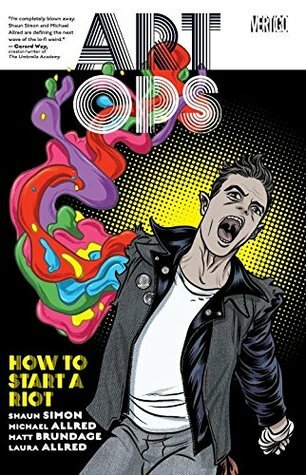 Art Ops: How to Start a Riot is a graphic novel that has an interesting concept about ‘saving’ art, but simply rambles in a psychedelic manner. Storm’s Coming! is a really simple, beautiful children’s picture book that, while it will have special appeal to Minnesotans and this familiar with the Split Rock Lighthouse, will be enjoyed by anyone who appreciates quality art (by David Geister) in a children’s picture book and/or informative lessons in nature and history. Author Margi Preus has written a really simple but tight story about a young girl who sees a storm coming in and runs about the property informing all the family, who are busy with a variety of chores (from picking fruits and vegetables in the gardens, to hanging laundry. to baking, etc). As she goes she sees all the signs of a coming storm in how nature reacts (the change in bee behavior; the way plants close up; the way birds fly lower to water; etc). This is just the way a picture book should be… beautiful to look at for the child listener, with some nice life lessons that the child doesn’t even realize s/he is learning while listening to the story. This is highly recommended. I suspect sales, on location at Split Rock will do well, but this should be enjoyed by anyone who enjoys reading to children. Looking for a good book? 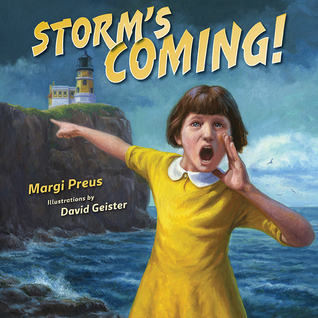 Storm’s Coming!, written by Margi Preus and illustrated by David Geister, is a beautiful children’s picture book with special appeal to Minnesotans but should be enjoyed by anyone interested in quality picture books. I received a digital copy of this book from the publisher, through Edelwiess, in exchange for an honest review.